… and I’m really good at shaking sticks at free music. If you have an Xbox Music subscription make sure you install the Music Deals app. 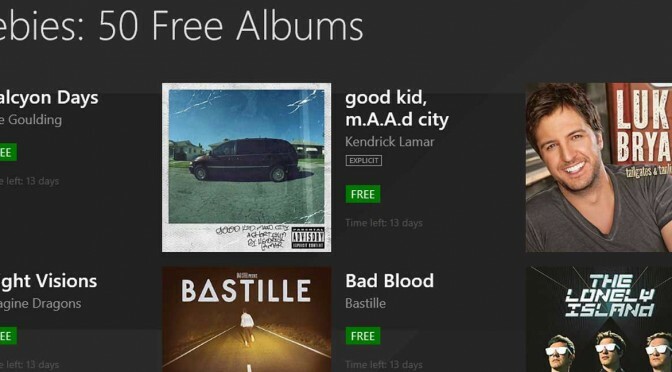 Back in November Microsoft released 100 albums for free, and now for December they’ve released another 50 free albums. 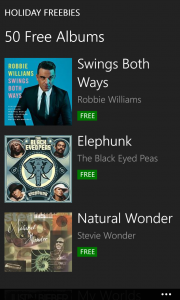 There is a catch, of course: you need to have an Xbox Music subscription* (… or not, see note at end). Since the subscription is only $10 you may want to subscribe just to download the albums… you can always cancel right after. Now you’re likely thinking: “it’s probably just a bunch of crappy old music, only available for Microsoft devices and with obnoxious rights-management handcuffs.” That’s what I thought, and I was wrong. The albums aren’t DRM-crippled and they’re not 96kbps samples… they’re 320kbps MP3 files and MSFT has released apps for iOS and Android. Another great thing is there’s lots of great music from a good selection of genres. Most people’s musical tastes should be covered. 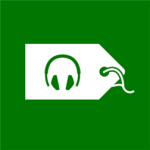 Since my taste is fairly indiscriminate I made out like a bandit – 65 free albums and counting! There is an expiration date on this deal, however… the first 100 albums are already gone and the latest 50 will expire in a little over a week. Leave a comment below if you’re able to download the music without a music subscription. You can either treat your fans as a necessary evil, or you can embrace them. The Japanese band Sour went one step further and made their fans the stars of their latest music video. The concept: ask your fans to do specific actions in front of their web cams, then assemble the individual actions into a complex dance involving people from around the world. This is fantastic. Rock on violin dude! It’s been a while since I pulled down some good free music. I stopped obsessing over every Mercedes Benz Mixed tape and haven’t gone on a mash-up bender for years. Yesterday, however, a couple free albums caught my attention. Harvey Danger has put their third album up for a free download in the hopes that you’ll try it, like it and buy it. While the album is free, the band is relying on your honesty to buy it if you like it. I personally like this model, partially because I have a huge tendency to feel guilty about intellectual copyright so I’m sure I’ll pay if I like it. I do hope that enough of the public also steps up and pays because I’d be really cool to see this type of trust continue. My take? It’s catchy pop/rock with pervasive piano and harmonies giving it a decidedly Beatle-esque feel (which isn’t bad in my book). And, heck, they’re a Seattle band. Note: if you really like it you may want to get the CD since it has 9 more tracks. Perhaps they’re touring together because they have similar music, perhaps it’s mutual respect between the bands… I think it’s just because they realized that combining their names creates "NIN|JA". 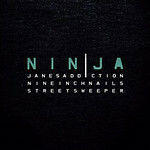 Whatever the reason, Nine Inch Nails and Jane’s Addiction (and Street Sweeper) are offering a free sampler album with two tracks from each band to help promote the tour. Unlike other "check us out, please" free albums, this one is promotional and doesn’t come with the guilt of needing to donate money (other than you should go buy tickets and see them live… unless you’re old like me and would probably break a hip in the mosh pit). My take? Classic NIN and Jane’s Addiction sound. Turn it up and let your ears bleed freely. I was also pleasantly surprised by Street Sweeper, a nice Industrial/Nu Metal blend with a bit of gansta’ rap special sauce poured on top. Bonus album: At the NIN site you can get The Slip for free too.